Deliver amazing Presentations with our above template which consists an image of piggy bank with dollar note. This image represents the concept of saving money for future use. Adjust the above image in your PPT presentations to visually support your content in your Business and Financial PPT slideshows income, wealth and investment. Deliver amazing presentations to mesmerize your audience. 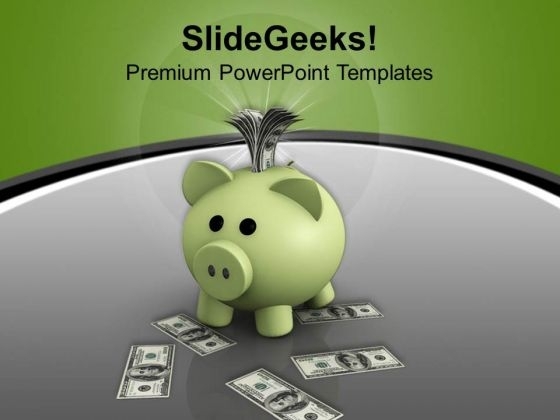 Unite your team with our Save Money For Future Finance PowerPoint Templates And PowerPoint Themes 1012. Download without worries with our money back guaranteee. Break throughthe fence with our Save Money For Future Finance PowerPoint Templates And PowerPoint Themes 1012. Your ideas will bring down all barriers.